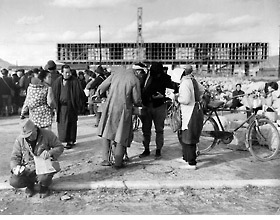 Under the Peace Memorial City Construction Law, not only streets and parks but also commemorative facilities for ever-lasting peace were decided to be included in the construction project. The Peace Memorial Park and Peace Boulevard have become symbols of the Peace Memorial City, Hiroshima. However, there were many trials and tribulations in the process prior to their completion. Financial difficulties often delayed the construction and the evacuation issue hampered the progress of the project. In addition, criticism arose over the issue of whether improvement of the lives of citizens who had suffered from the housing shortage should be prioritized over urban planning. Both, these urban planning efforts and improvement of civil life were the reality of Hiroshima for Sasaki. In April 1949, just before establishment of the Hiroshima Peace Memorial City Construction Law, the competition for designing the Memorial Park and the Peace Memorial Museum in Nakajima District and the surrounding area was launched. The winner of this design competition was a group led by Kenzo Tange who was then an assistant professor at Tokyo University. 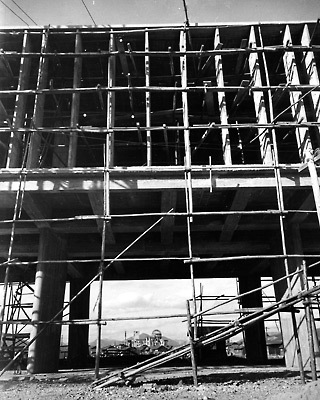 The construction projects of the Hiroshima Peace Memorial Museum and of the Peace Memorial Park were initiated in February 1951 and March 1952, respectively. At the beginning of construction, the Peace Memorial Museum was called the "Memorial Museum of Atomic Bomb Relics." The A-bomb Dome can be viewed between the supports. Shacks were crammed into the site for the Peace Memorial Park under land-clearing operation. 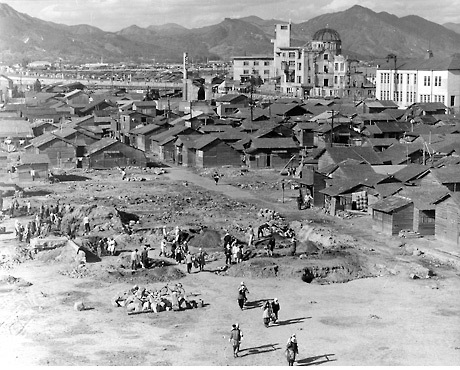 As a relief program for the unemployed, many day workers including A-bomb victims and demobilized soldiers were assigned to land-clearing activities at the site of Peace Memorial Park and the construction work of Peace Memorial Museum. Vendors sold bread and rice balls to people coming to receive daily wages. As land clearing operations for Peace Memorial Park gradually advanced from the south, the overcrowded shacks disappeared one by one. The white building at the right edge is Fuel Hall. On the other side across Motoyasugawa River, the A-bomb Dome and Hiroshima Chamber of Commerce and Industry can be seen.